GoodReads Summary: A Cupcake in every locker! It's election season and if anyone knows what this country . . . er, what the student council needs, it's Babymouse. 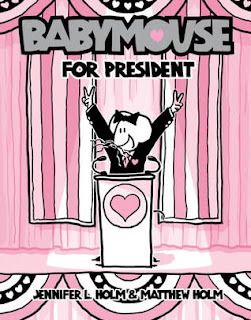 The only trouble is, everyone else is running for President, too—even Babymouse's locker! Will Felicia Furrypaws turn out the meangirl coalition? Does Babymouse have what it takes to become the voice of the people? Find out in Babymouse for President! Remember, a vote for Babymouse is a vote for cupcakes! What I Think: I always love Babymouse. It's hard not to love Babymouse. If you ask me, this book, and all the Babymouse books really, are perfect examples of characterization. Jenni and Matt Holm do a great job of bringing her to life between how she is drawn to what she says and how she interacts with the narrator. They do an amazing job of bringing her to life with a lot of personality. One great thing about graphic novels is that kids can read them fairly quickly but they are so engaging that kids can read them again and again. I'm a new fan to rereading but it really makes sense to reread graphic novels that are short enough to read and reread without it being a chore. I love that kids can read through and get all the elements of a story and understand how a story comes together and plot development in such a fun way. Writing Prompts: Write a letter to your classmates or teacher about what you think needs to change in your school and why. won two copies of Babymouse for President! I was so excited that I'm giving one away!